In recognition of this year’s National Nursing Home Week theme, “The Spirit of America”, Pierce Memorial Baptist Nursing and Rehab Center hosted a flag raising ceremony on Tuesday, May 16. 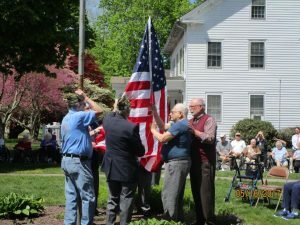 Residents and staff from both Pierce and Creamery Brook Village attended the ceremony, as well as representatives from the Am-Vets organization. Resident veterans were recognized by name and military branch, and honored for their service. Pierce resident Burton Sacknoff, a veteran of the U.S. Air Force, assisted the Am-Vets representatives in the unfolding and raising of the American flag. Both residents and staff were pleased to commemorate National Nursing Home Week’s theme with this patriotic event.